A new roof can protect your home from the elements and improve your curb appeal in an instant. At Texas Star Roofing, we use high-end roofing materials from award-winning manufacturers and install all of our roofs according to the manufacturer’s specifications. Call us to get a free estimate today. 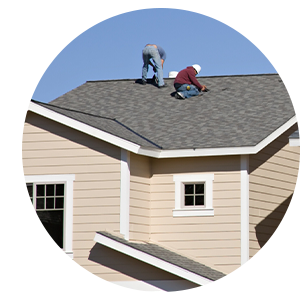 When the time comes, Texas Star Roofing is the company you can trust for roof replacement in Dallas. If you’ve lived in Texas awhile you know your roof can be damaged by wind or hail. Roofs, just like everything else in life, eventually wear out. So when it’s time to get to work, contact Texas Star for a free roofing inspection, and we’ll let you know whether you are a candidate for a roof replacement or if your roof can be repaired. Re-roofing your home is a major construction project, and Texas Star Roofing strives to make the experience as painless as possible. After all, we’re taking your roof off completely and putting it back on, and, in some cases, adding a layer of plywood deck to nail the new shingles to. That’s why we utilize large, skilled crews to complete the process as quickly as possible. Living in a construction zone is enough of an inconvenience in itself, so we don’t want to make that intrusion last any longer than it has to. We remind you to remember that when your roof is off, your home is vulnerable to the weather conditions. At Texas Star Roofing, our contractors not only do the job as quickly as we can; we do it in sections that can be removed and replaced, or at least dried in, in short periods of time… We don’t tear off your roof and hope to get it back on before it rains! Texas Star never compromises quality for the sake of speed. That’s why there is a method to our approach, designed to keep you and your belongings high and dry, and to have you back to normal (and better) within a couple of days. Request a free, no-obligation roofing inspection by filling out the form of this page.